Bet you haven’t heard that before. We’ve discussed patient compliance and pharmacy access as it pertains to independent community pharmacies and community health centers. But how do we overcome the barriers that prevent medication adherence? When we say “barriers,” we mean geographic location, how busy we are, cost and forgetfulness. There are many reasons a patient may not be adherent to their medication regimen. There are also great solutions focused on helping pharmacists and pharmacies overcome those obstacles. Here are four ways to help patients overcome barriers to medication adherence. No matter what it is, everyone needs a reminder at some point. Mobile applications and other technology functions can help patients remember to take their medications and fill their refills as well. For example, adherence-driven mobile applications, such as Pharmacy Marketing Advantage from Cardinal Health, help thousands of patients submit their prescriptions for refills. The multi-channel marketing package provides a way for patients to initiate a refill via your pharmacy’s website, mobile app or through text messaging. HIPAA-compliant pharmacy-branded mobile apps also provide patients with reminders and gives independents the same functionality as large national retailers. Technology can help automate the refill process which, in turn, help patient adherence. The question is, does your pharmacy have a mobile application that accepts refills? Pro tip: pharmacists can even help patients program the alarm clock on their phone, or help them set smartphone-based reminders. This is a simple yet effective solution to help patients stay adherent which can be done during any consultation. Whether it’s old age or the busy lives we live, sometimes we forget to pick up our medications. Implementing a medication synchronization solution is a key component of overcoming barriers to adherence. Medication synchronization (or MedSync) allows patients to pick up all of their prescriptions during a once-a-month appointment with their pharmacist and pharmacy. This appointment-based model provides dedicated time for pharmacist-patient dialogue, and also allows time for additional patient-care services. Web-based solutions, like MedSync Advantage, help easily identify eligible patients to synchronize, which helps improve patient care and adherence overall. The time-saving solution is also the only medication synchronization product on the market that offers insights into which patients are subject to DIR fees so you can prioritize your synchronization list. While pharmacists and pharmacy technicians will tell you that there’s a bit of extra work up front to set up a medsync program, the benefits as far as increased adherence, more efficiency and better inventory control are worth it. When thinking about a better way to get patients to take their medications, it doesn’t get much easier than multi-dose packaging. For patients, multi-dose packaging is a convenient, personalized time-saver that keeps prescription drugs organized so there’s no guessing game involved. For pharmacies, all-inclusive blister packs can help differentiate your business, improve medication adherence among members, and it also opens the door to increase your customer base with long-term care and at-home patients. Multi-dose packaging solutions like Dispill® feature packaging for morning, noon, evening and bedtime, and also help encourage more timely medication refills and build patient loyalty. Plus, blister packs are a great way to stay competitive with chain pharmacies in your area. Access to healthcare is a hot topic today, and rightly so. Millions of underserved Americans do not currently have convenient access to clinics, hospitals, pharmacies and other essential healthcare services. Telehealth technology, such as telepharmacy, is here to change that. Telepharmacy can be used in a variety of ways to help patients overcome barriers to adherence. Independents can open brick-and-mortar retail telepharmacy locations in small towns and underserved areas, hospitals and clinics can open outpatient telepharmacies onsite and provide dispensing at the point of care, and the same goes for mental health centers, long-term care facilities, employers campuses and schools. New pharmacy technology, like TelePharm, can help improve medication adherence because it’s not physically possible for pharmacists to be everywhere at the same time. And according to a report by the U.S. Public Health Service, access to a pharmacist has been shown to be highly effective in improving outcomes. Interested in more information? Download our ! 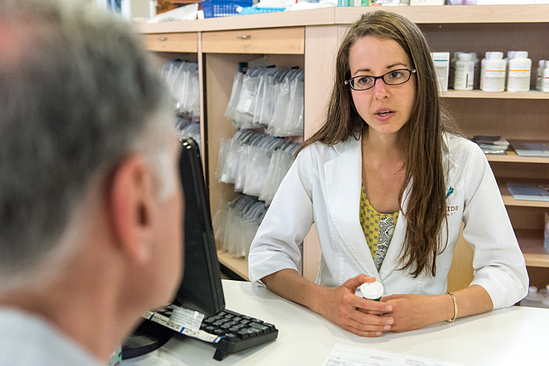 Better access to pharmacists leads to better medication adherence. What are you doing to help your patients overcome adherence obstacles? Let us know in the comments!